The ASRock Z68 EXTREME7 GEN3 is the ultimate Z68 platform which supports the next-gen PCI-E 3.0, offering more bandwidth to enable faster communication between components inside a system. Coming with NF200 chip and 5 x PCI Express x16 slots, the Z68 EXTREME7 GEN3 supports NVIDIA 3-way SLI and AMD 3-way CrossFireX to multiply your graphics performance. With PLX PEX8608 chip embedded, the Z68 EXTREME7 GEN3 ensures all PCI-E devices work at proper speed simultaneously. Manage your priorities of internet applications with the XFast LAN tool and boost your USB performance with the XFast USB technology. With the superb XFast Charger USB port, you can charge your mobile devices via PC quickly. The advanced V8 + 4 Digi Power Phase design, premium Gold Caps and 100% Japan-made high-quality Conductive Polymer Capacitors provide top quality, extreme performance and ultimate stability. 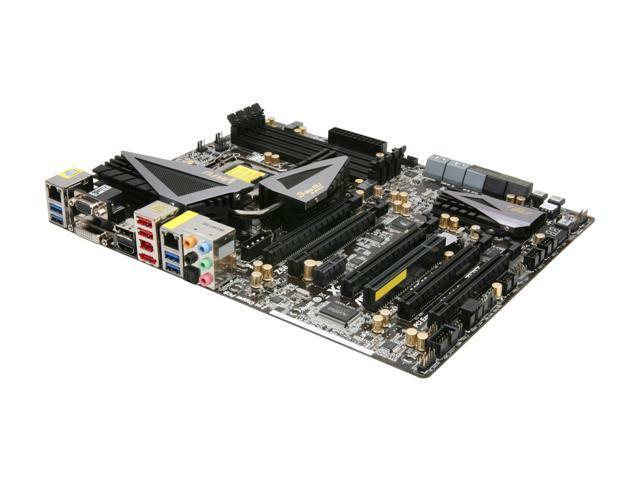 This PCIE Gen3 board also offers native SATA 6Gb/s and 6x USB 3.0 connectivity, as well as ASRock’s latest innovations like Graphical UEFI and ASRock Extreme Tuning Utility (AXTU). It’s time for GEN 3. XFast LAN Technology ASRock XFast LAN is a smart productivity tool to help you manage your priorities of internet applications, simplify your digital life and accomplish more. The innovative features include: Internet Application Prioritization, Lower Latency in Game, Traffic Shaping and Real-Time Analysis of Your Data. It's the smartest way to control your web programs. ASRock XFast Charger XFast Charger is the best and fastest technology to charge your mobile devices via PC. With the superb XFast Charger USB port, you are assured to enjoy the quick charging experience anytime. In addition to Apple devices, it is also capable of Charging the BC 1.1 standard smart devices. ASRock XFast USB Technology - Faster Than Your Imagination! ASRock XFast USB Technology redefines the new standard in high performance computing. Proving once again to be the pioneer in motherboard industry, ASRock XFast USB Series Motherboards integrate with the latest XFast USB Technology which delivers the world's fastest USB data transfer speed. The ASRock XFast USB technology can even boost USB 3.0 performance up to 302.99%! PLX PEX8608 Chip Onboard ASRock Z68 EXTREME7 GEN3 breaks the limitation and offers sufficient PCI-E lanes solution by embedding PLX PEX8608 chip onboard. With PLX PEX8608 chip, it generates more PCI-E lanes for PCI-E devices, so that all PCI-E devices are able to work at the proper speed simultaneously! NVIDIA NF200 Chip Onboard And the onboard NVIDIA NF200 chip generates more PCI-E lanes for you! The ASRock Z68 EXTREME7 GEN3 provides leading-edge graphics performance and flexibility with support for NVIDIA 3-way SLI and AMD 3-way CrossFireX on demand. With this chip onboard, ASRock motherboard is capable of running dual VGA cards at PCI-E x16 / x16 mode and three VGA cards at x16 / x8 / x8 mode to get maximum graphics performance. Pros: Board looked nice, had to RMA once this was back in 2012. It never seemd to overclock very well, I had always used ASUS before purchasing this board. Cons: 1. PCIE slot for does not work at all, just will not be detected. I use crossfire with 2X HD 6970s and I have always used the slot 1 and slot 4 like the manual says, well I started playing games that did not require crossfire to run so I decided to take my 2nd card out and move the remaining card to slot 2, like the manual says. Then I wanted to start playing more highend games, and now the port just seems to be dead. So I have to use slot 2 and slot 5, which is only a 4x slot. The bandwidth of the 4x slot causing stuttering and artifacts, and now my computer wont even go past 4.0ghz with a very high end cooling system. No matter what volts I put into the settings it just wont boot past 4.0ghz use to do 4.5ghz easy at less than stock volts. I had though maybe my PSU was dying so I had that RMAed and nope problem still persist. This is an awful predicament for me, cause I spent so much money on this board hoping i would have some future proof, Now with my again graphics card I was planning on just upgrading them this year, but because the board is dying and I am past Newegg's warranty and not even sure how to get ahold of Asrock support. I went to their forums and didnt even get a reply. And even at 4.0ghz the computer is very unstable now. This is just Awful I dont have the money to shell out for a whole new platfoum. CPU/MOBO Graphics cards. Pros: Best aesthetics on a z68 board out there, in my opinion. Overclocks my 2600k up to 5.2 GHz stable. I run at 4.8 GHz for 24/7. Overall layout of the board is nice and seems well thought out. Cons: Definitely does not have enough USB ports for a high end motherboard. It only has 6, and IMO 10 should be the minimum for a $200+ board. I had to buy a USB 2.0 hub to connect all my devices. It loses an egg for this. -The placing of the PCI-e power connector for running multi-GPU setups is obnoxious and difficult to connect. And why is it a 4-pin molex? Weird. -Has a couple of different SATA 6 controllers on board, and you have to be careful which port you connect your boot drive to (the board and manual have ample warnings/instructions about this). -Much of the bundled software is just bloat/crapware. For example, Xfast USB and Xfast LAN seem to do nothing. Just install the drivers and leave the rest of the stuff off. -Built in OC presets set the voltages too high. You're better off doing all your overclocking manually. Other Thoughts: Great board. Very happy with it; I refuse to spend $200 on super-generic black/blue boards from the competition. ASRock has a board that immediately stands out visually and delivers on all the desired features. If you want to run an overclocked socket 1155 CPU with a multi-GPU setup, and you can live with too few USB ports, this is the board for you. Comments: Gavel, while it's possible you got a bad MB, I've had two things that gave me BSODs. Keep in mind that before I ever got even ONE, months had passed and my system was rock solid. The first thing that caused them was new drivers from ATI (3x 6950). All of the 12.X series for me had caused problems when activating/de-activating monitors or crossfire. I went back to the 11.12 drivers and everything has been peachy - no more image corruption in Solidworks either. The second thing is those m4 SSDs. You bought yours before I did, meaning you got the old firmware. All m4 SSDs had a bug in the firmware. Once the drive reached 5182 operating hours, the drive to become unresponsive after an hour. A power cycle solves the problem but it of course returns again after an hour. If you haven't already, use CrystalDiskInfo to check the on-time of your SSDs and the firmware version. If needed, update to the newest one. It's straightforward and may be your problem. Comments: I've purchased about four Asrock motherboards and this is the first that has had issues. The reason this is a five star rating is that the service I recieved to get my board replaced was stellar. I talked to real people, who were interested in helping me solve the problem. Stephanie at Asrock kept up communication throughout the whole process and let me know what was going on at their end. I'm very pleased. Excellent product, excellent company, and excellent service.